It wouldn’t be a Richard Linklater film if you didn’t go in expecting one thing and come out with something totally different. Bernie adds another diverse note to the (predominantly) indie filmmaker’s eclectic resume, which includes his celebrated debut efforts Slacker and Dazed & Confused, the romance duo Before Sunrise and Before Sunset and mainstream efforts The School of Rock as well as the remake of Bad News Bears. With Bernie, Linklater takes a page out of the Christopher Guest handbook by turning the true story of an effeminate East Texas mortician who befriends a bitter old wealthy widow into a staged documentary. It seems best to avoid the ever-enticing term “mockumentary” because the film doesn’t use the documentary style to depict fictional characters and events and its subjects are not the ones providing interviews, only outside voices. 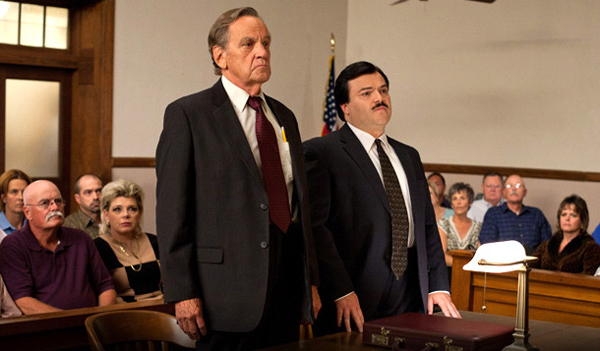 The story of Bernie Tiede comes about as straight from the headlines as you can get. Skip Hollandsworth, who wrote the 1998 Texas Monthly article that inspired the film, provided his materials and assisted Linklater with the screenplay. Although the film could have easily been done as a traditional narrative or as a regular documentary, Linklater decides to intersperse reenactments and truth-based scenes featuring Jack Black as Bernie, Shirley MacLaine as the widow Marjorie Nugent and Matthew McConaughey (who got his start in Dazed & Confused) as D.A. Danny Buck with interviews (though written and rehearsed) from actual East Texans who knew the real-life Bernie, Marjorie and Danny. So there’s a distinct journalistic effort that went into the making of this film as well as an aura of authenticity that traditional dramas inspired by true events simply don’t have. The trade-off is we don’t get the experience of a true narrative that slowly builds and allows us to make our own assessments about the characters. Instead, we’re given an outsiders perspective flushed with the opinions of the local actors. But once you know Bernie’s entire story, you might be inclined to agree with Linklater’s artistic choice. Although I personally found it beneficial to go in knowing nothing (skip this paragraph if you’re of that mind), Bernie is a magnanimous assistant funeral director, a small-town celebrity adored by all who decided to befriend Marjorie, the town curmudgeon. Eventually he becomes her companion, accompanying her on trips all over the world, and then her personal assistant. But when he realizes that she’s trapped him in her icy grip and doesn’t appreciate him at all, in a sudden blind rage he shoots her in the back and then spends the next nine months pretending she’s alive. Most of the film focuses on building Bernie’s character and his relationship with Marjorie. Black gives one of the best performances of his career transforming into this kind-hearted effeminate man who refuses to see anything but the good in people, even if the pseudo-documentary structure prevents him from creating a whole lot more than a quirky character portrait. At the same time, this artistic control over how much we feel we get to know Bernie as well as the significant amount of time spent leading up to the turning point of the story forces us to have to sort through all of the reporting work and the outside influences for our own opinion. Our limited access also keeps Linklater’s own thoughts completely out of the equation, so in a sense he really has made a documentary of a sort. The cast of locals really add the color and character to the film and offer 90 percent of the humor as well. Like all Southerners, they shoot straight and make crude comments in the most amicable and polite way possible. Although it’s all scripted, you get the sense that more or less, none of the “actors” say anything that they otherwise would not have said if interviewed in real life. Bernie plays as a light-hearted black comedy presented in a way you never imagined it could, but the fact of the matter is that Bernie’s story is a fascinating one. Linklater really doesn’t aim to do anything but present it with all the quirk and color that it inherently possesses. The moral question/debate at the story’s core makes it go from an amusing tale to an important one, but some viewers might become frustrated at the film’s just-below-surface exploration of it. Bernie leaves you with something to chew on rather than doing much of the chewing, which will be most problematic for those already familiar with the story and its outcome going into the film. For those who haven’t heard of Bernie Tiede or didn’t know East Texas was a place, this is an unforgettable and bizarre story that poses some important questions and Bernie presents it with great admiration for how truly distinct it is.